Dubai: There are "7 shifts shaping future cities" which will pave the way for "human-centric metropolises". This was emphasised by Shaikh Hamdan Bin Mohammad Bin Rashid Al Maktoum, Crown Prince of Dubai and Chairman of Dubai Executive Council, during a talk at the World Government Summit using virtual reality to emphasise on how Artificial Intelligence (AI) and technology form the wave of the future. Dubai is hosting the three-day summit attended by experts and heads of state at the Madinat Jumeirah. He discussed seven shifts cities need to take in order to become future cities. “Artificial and automated vehicles are the future," he said. "Cities will be more secure and connected. We will see at least 50 more devices per person on earth. This increase will cause a revolution of data.” He added that thanks to visual reality, I am able to be with you while I am far”. The seven shifts the Crown Prince touched upon revolved around transportation and design, mobility, technology, energy and energy storage, production of food and legislation. He discussed how technology will innovate and change. The number of people will be monitored on the road, and the people serviced on the road. The need was to enable people to get from place to place fast and safely. Hamdan linked the time spent on the roads to happiness and how a person’s happiness quotient gets affected if they spend more time stuck in traffic. He said that “mobility” is key and so is accessibility, adding that the development of better tracks will help this problem. He also touched upon the need for houses to become more green and efficient. Economies will change and so will legislation and government. Data economies are the future and it will exceed oil. Consumption patterns will change and food shortage to manage the growing population will be a challenge too. He told the audience: “There will be nine billion people in the future with more people moving towards urban areas and cities. We have a challenge in the productivity of crops. “The cities of the future will be food baskets for individuals, thanks to the flourishing of production techniques." Hamdan concluded his speech by saying that the people are the future. In the future, every single window (car, buildings etc) will be a solar panel. In the future, every single window (or a car, building, etc) will be a solar panel, said Shaikh Hamdan on how renewable energy will be cheaper in the future. 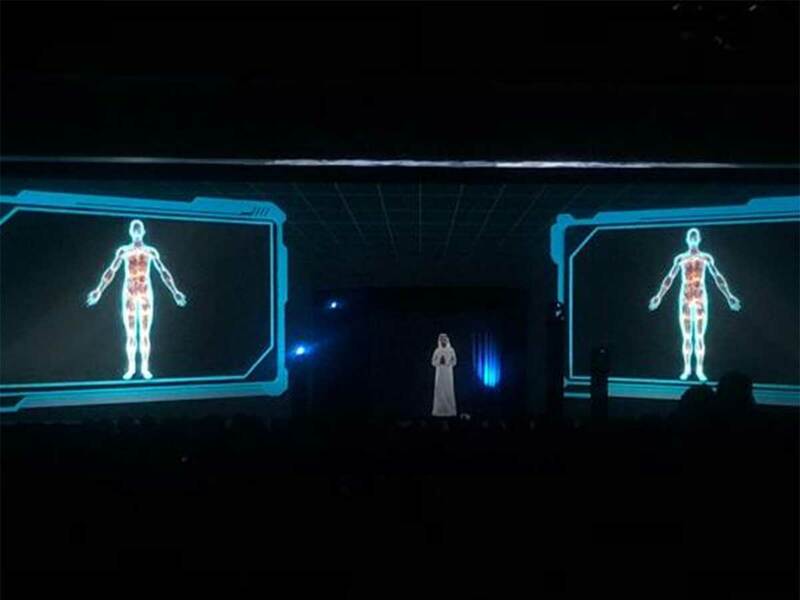 A hologram is a photographic recording of a light field, rather than of an image formed by a lens, and it is used to display a fully three-dimensional (3D) image of the holographed subject, which is seen without the aid of special glasses or other intermediate optics. It is useful in making virtual reality or "enhanced reality" possible.